There are many ways our future will change because of AI. We heard it many times, but now the Vatican is talking. BBC recently reported about a workshop on robotics held at the Vatican’s Pontifical Academy of Life. The theme is “Roboethics: Humans, Machines and Health”. Pope Francis in his opening keynote pressed the need to think about societal costs when develop new technologies, particularly in robotics. The future of robotics needs to be shaped in accordance to what it means to be human because otherwise there would be unpredictable damages to future generations on the planet. Why is the Vatican concerned? Robots have been made with the idea that maybe human bodies should transition from organic to inorganic forms. We, as humans, “will no longer be recognized as flesh and blood humans, in 10,000 years time”, said Japanese Professor Hiroshi Ishiguro of Osaka University, who is world-famous for making human-like robots. The Vatican disagreed. Archbishop Vincenzo Paglia, President of the Pontifical Academy for Life, said that “this dream is a terrible dream,” adding that it was “impossible” to divide the body and soul. Questions about the morality of AI and robotics have been raised by many, for example, in a report last year by the European Group on Ethics in Science and New Technologies. The AI World Society (AIWS) of the Michael Dukakis Institute for Leadership and Innovation has also published a report on AI Ethics suggesting a framework for promoting ethical norms and practices in the development and use of AI. 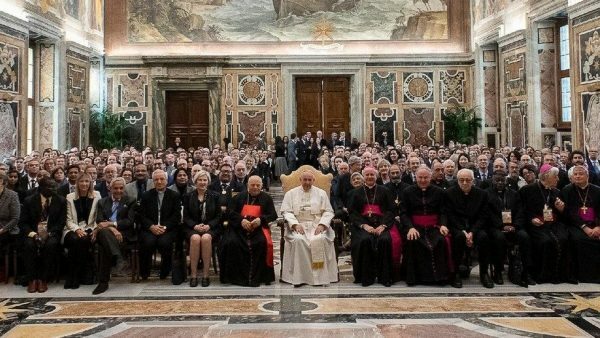 The Vatican recently partnered with Microsoft to offer an international prize on ethics and AI. The Pontifical Academy of Life already set the agenda for next year’s meeting to focus on AI. The attention of the Vatican on the issue is noteworthy and the upcoming actions guided by Pope Francis could be a factor in the future of AI, which in turn, will shape the future of our lives.